Rob let me pick out my own birthday present this year. (I am one lucky lady.) I know this isn't the bike I posted in my little b-day wish list round up, but that bike wasn't green. We did a little more research and I came across this bike from Critical Cycles. 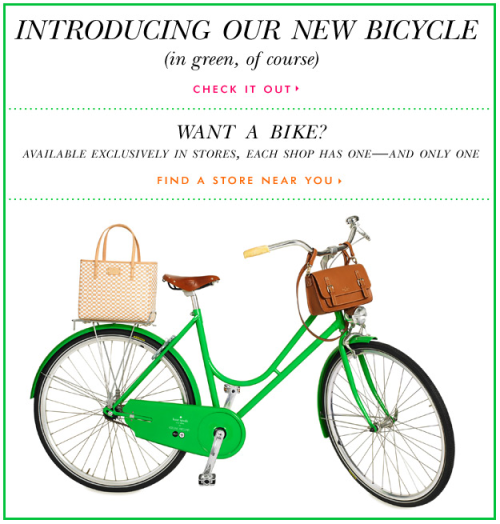 I've kind of been obsessed with having a green bicycle since seeing a photo of the Kate Spade one. If you're also from Maryland, you probably know all about the hike in our gas tax, seems like the perfect time to return to the childlike joy of getting everywhere by bicycle. My helmet and a wooden crate to carry all my goodies are on the way :-). Anyone else trying to drive their car less these days?